Filipinos wore yellow clothes, tied yellow ribbons, and hung yellow banners, while helicopters threw yellow confetti over them in the streets of Manila, the capital of the Philippines. Yellow was the color of Corazon Aquino, one of the Philippines’ most loved leaders, who died on August 1. People have been living in the Philippines for thousands of years. In the 16th century, the Philippines became a Spanish colony and in 1898, it was handed to the United States. Philippines finally got its independence in 1946. In 1965, Ferdinand Marcos, a dictator, came to power and ruled for about 20 years. Aquino’s husband was a candidate who tried to oppose Marcos, but he was shot dead. Aquino, supported by the people of the Philippines, became the President of the country in 1986 for 6 years. She is looked upon as the person who brought democracy back to the country. 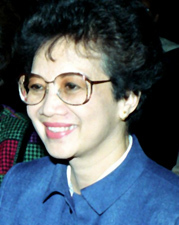 Aquino was selected as Time magazine’s “Woman of the Year” in 1986. A play, “Cory, the Musical”, has also been written about her. The Philippines is named after a Spanish king, Philip II, from the 16th century. It is a land of islands (over 7000), mountains, rainforests, hot & humid climate, coconuts, mangoes, volcanoes, typhoons, and lots of languages! It has also been named as the “Texting Capital of the World”. In 2007, Filipinos sent an average of 1 billion text messages per day. In fact, in 2001, many protests were organized using text messaging to force one of the Presidents from office. Not only do the Filipinos use their cell phones for texting but also as a wallet – to pay bills and send money. A local dance is the tinikling – two people tap bamboo poles while some people dance stepping over the poles. A cheap form of public transportation is a ride on jeepneys. They are brightly decorated covered jeeps and are usually packed with passengers. 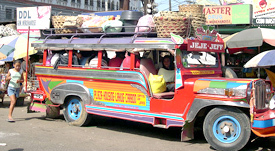 Jeepneys were originally created from the jeeps the American troops left behind in the Philippines after World War II .